(Brooklyn, NY) - Executives from Ronald McDonald House New York (RMH-NY), NYC Health and Hospitals (HHC), and HHC Kings County Hospital Center held a ceremony yesterday to kick off the construction of a Ronald McDonald Family Room located inside the hospital. This represents the first major capital project between the organizations since the children’s charity began providing programs designed to serve local families with children in the neonatal intensive care unit. HHC’s philanthropic arm, The Fund for HHC, which cemented the capital expansion agreement, will be managing the creation of Family Rooms throughout the corporation. The Family Room is expected to be completed and open for use by NICU families in spring 2016. “We are so pleased to have developed this partnership with a patient-centered organization like RMH-NY, because it illustrates and complements our commitment to HHC’s guiding principles – especially that the patient experience is paramount,” said Joe Schick, executive director of The Fund for HHC. The Ronald McDonald Family Room at HHC Kings County Hospital will serve as a respite care facility for caregivers of patients in the NICU and will offer a kitchen, washer and dryer, bathroom, and lounge area sponsored by Macy’s to provide an area of relaxation and a place to recharge for the families of children receiving inpatient care. Speakers from RMHNY and HHC Kings County Hospital included Mr. Sullivan; Harris Diamond, chairman and CEO of McCann Worldwide, vice chairman and chairman-elect of the RMH-NY board of directors, and head of the board’s strategic planning committee; Dr. Ram Raju; Lee Perlman, executive vice president of administration and CFO of the GNYHA Ventures, and RMH-NY board member; Mr. Baptiste; and Brooklyn Deputy Borough President Diana Reyna. 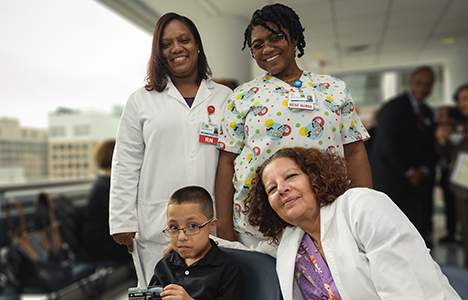 The Strategic Planning Committee of RMH-NY launched the Hospital Outreach Initiatives in 2012, providing programming activities for inpatient families within the HHC Kings County Hospital NICU department. In April 2015, a study published in the Journal of Health Organization and Management showed a strong majority of hospital administrators in 16 countries agree that Ronald McDonald House programs play a significant and important role in family-centered care for children with serious medical needs.1 This will be the first Family Room located in Brooklyn, joining 196 Ronald McDonald Family Rooms in 23 countries and regions. The Fund for HHC is the philanthropic arm of the New York City Health and Hospitals Corporation (HHC). The Fund seeks external support for HHC’s clinical programs that align with the organization’s strategic priorities, oversees two signature programs – Guns Down, Life Up and Music & Memory – and manages a robust internal grants program. The Fund has worked for more than a year to help concretize HHC’s relationship with RMH-NY, including initiating the partnership, securing approval from HHC’s Board, and managing the execution of the License Agreement. For more information, visit http://www.thefundforhhc.org. 1 Lantz, Paula M, Nicole Rubin, and D Richard Mauery. "Hospital Leadership Perspectives on the Contributions of Ronald McDonald Houses." Journal of Health Organization and Management J of Health Org and Mgt, 2015, 381-92.